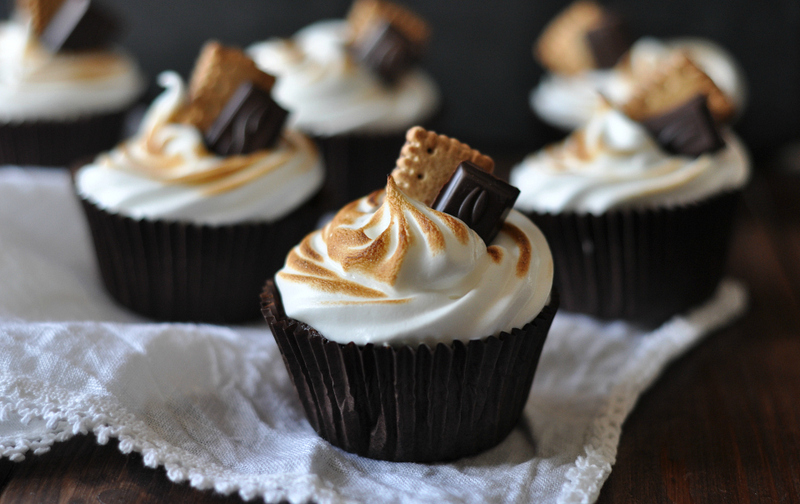 Today, we have a very special guest with an amazing recipe here on The Daily Dose – Sara from Birds Like Cake created some delicious cupcakes for the colder season: S’mores Cupcakes! She has one of the most beautiful food blogs out there and even won the 6th place at the AMA Food Blog Award 2013 – now that has to mean something! Cooking is her passion, baking is her specialty and for today’s feature she whipped up something festive, winter-y and super yummy. The taste of butter cookies meets cocoa and the flambéed frosting basically scream holidays – serve them with hot chocolate, cuddle up on the sofa (or even better: in front of a fireplace) and enjoy your S’mores! Preheat the oven to 180°C and line the cupcake pan with paper liners. Crush the butter cookies and melt the butter, combine these two ingredients and mix well with a fork. Drop about 1 tsp. cookie mix in the bottom of each cupcake liner and press down to line the bottom. Bake for 5 minutes. Remove from oven and maintain the temperature. In a small mixing bowln combine the cocoa powder with hot water and vanilla extract and whisk until smooth. Set aside. In another mixing bowl mix together flour, baking soda, baking powder and salt, whisk and blend. Set aside. Combine the butter and sugar in a mixing bowl set over a medium saucepan on medium heat. Stir frequently until the butter is melted. Remove from heat and beat with an electric mixer for about 4 minutes, until the batter is cooled down. Add the eggs one at a time, mixing well after each addition. Blend in the cocoa mixture until smooth. Alternating add the flour and the sourcream, beginning and ending with the dry ingredients. Mix until incorporated. Divide the batter evenly between the prepared liners, fill until they are about 3/4 full. Bake until toothpick inserted in the center comes out clean, about 18 minutes. Let cool in the pan for about 5 minutes, transfer to a wire rack to cool completely. To make the frosting combine the sugar and egg whites in a clean, grease free mixing bowl set over a pan of a few inches of simmering water. Heat the mixture, but stir frequently until the sugar is completey dissolved (try between your finger tips). Remove from heat and start beating with an electrict mixter for about 8 minutes until stiff peaks form. Mix in vanilla until combined. Transfer to a frosting bag fitted with a star tip and frost the cupcakes. Brown with a kitchen torch (or put shortly in the oven) and decorate with small butter cookies and chocolate chunks (optional). 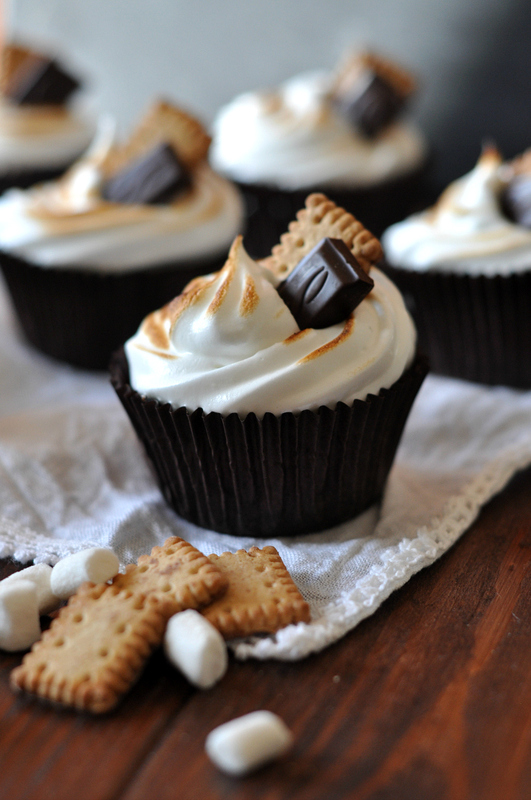 A big thanks to Sara for the delicious recipe and gorgeous photos! 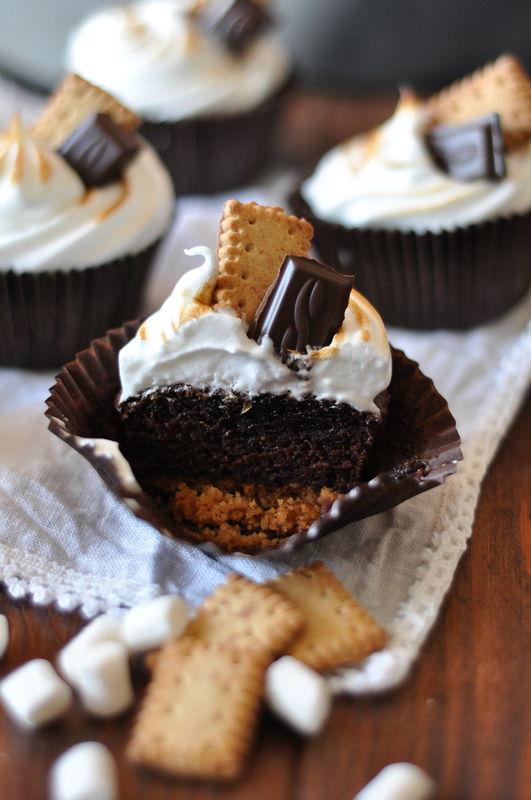 If you give these cupcakes a try, be sure to use the hashtag #tddrecipe on Instagram to show us how it turned out. Was ist der Unterschied zwischen baking soda und powder? Liebe Jessi, Powder ist Backpulver und Soda ist Natron. Wenn du kein Natron zur Hand haben solltest, geht auch statt dem Backpulver, jedoch werden die Cakes geschmeidiger mit Natron.